In case you didn’t know, a brand new, super awesome looking Power Rangers film is coming out. As should be the duty of every citizen, I’ve taken it upon myself to re-watch every Power Rangers episode I can find. Luckily, the gods smile upon this mission by giving me the tool of Netflix. If you’re a decent human being, then you’ve already read my review of the original Power Rangers series. As Buddhism teaches, all things change though, and as such, our favorite teenagers with attitude step aside for … Alien Rangers. Yep, just as there were some pretty awful episodes to the original series, we’re finding that there are also some awful versions of the Power Rangers IP. When transformed into kids, the now juvenile Power Rangers rely on the hope of alien allies from the water planet of Aquitar. These friends had shown up before in the original series in minimal doses, and that was fine. Having them for an entire 10 episode arc is a different story. While I appreciated that there was a running plot of the kid rangers trying to find a way to revert back to adulthood, there’s also some pretty goofy kid vs. bad guy Home Alone-esque moments that as an adult I could do without. There’s also the Aquitarians. Is that how we’re going to agree to spell it? That’s what I’m going with at least. 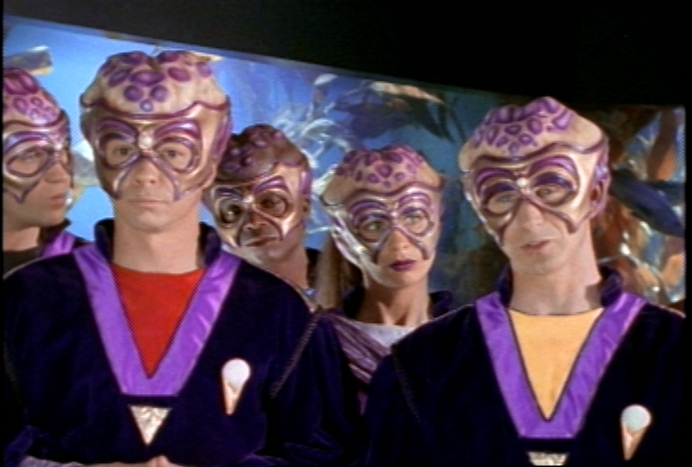 They lack distinct personalities and, looking back, I can’t remember their names or what they looked like besides the goofy alien head masks that the actors had to wear. If you asked me if I cared what their names were, I’d say no. Along the way, Billy reverts back to his old form so the show can have a scientist character working on getting the kids lean and mean once again. Aside from the tension of wondering where the hell the series is going, there is a huge ending, which serves as a bridge to the next iteration of Power Rangers. This is probably the first great example of a time when Haim Saban plays with the formula that made the show so successful, with very weird results. I don’t want to say that I watched it so you don’t have to, because I hate that phrase and mentality, but I want you to know that you’re getting into a pretty mixed bag.